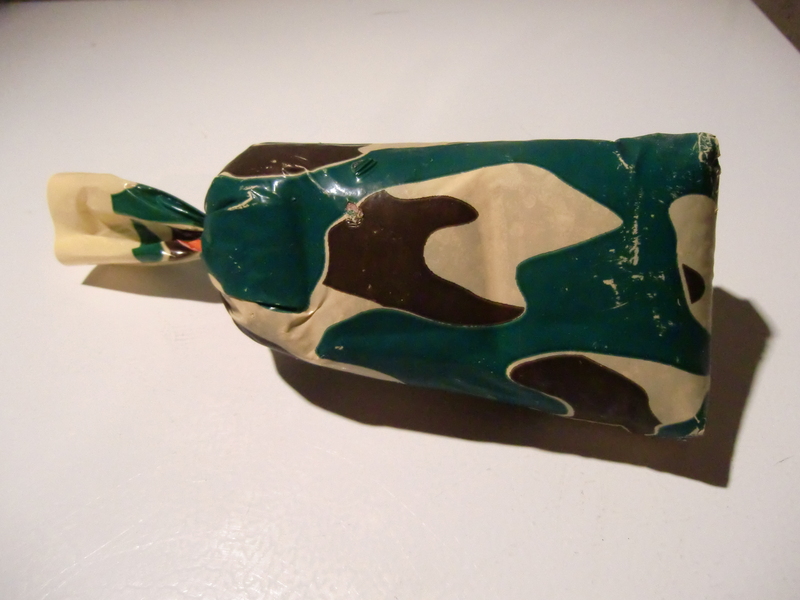 I was blessed with a pound of venison in a camouflage bag. Many thanks to my uncle and aunt, Robert and Candace Rice. This is rural Missouri deer meat, probably Bambi’s mother. Just thinking about that orphaned baby deer gets my mouth watering. 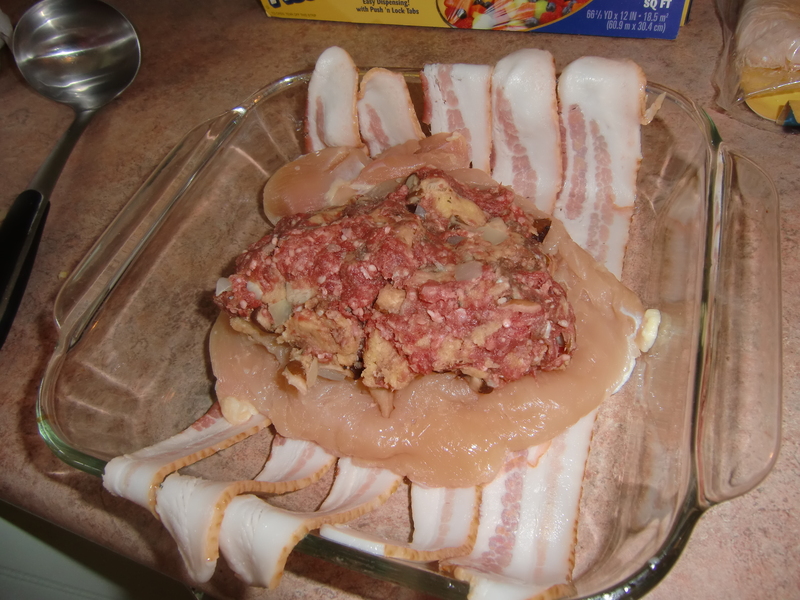 I decided to make a cornbread stuffing with the venison, then stuff some chicken breasts with it and wrap the whole thing in bacon. Sounds good, right? First, I got some Pepperidge Farm cornbread stuffing from the store. I put a tablespoon of butter in a medium sauce pan with three chopped garlic pieces and a quarter of a white onion for about five minutes. 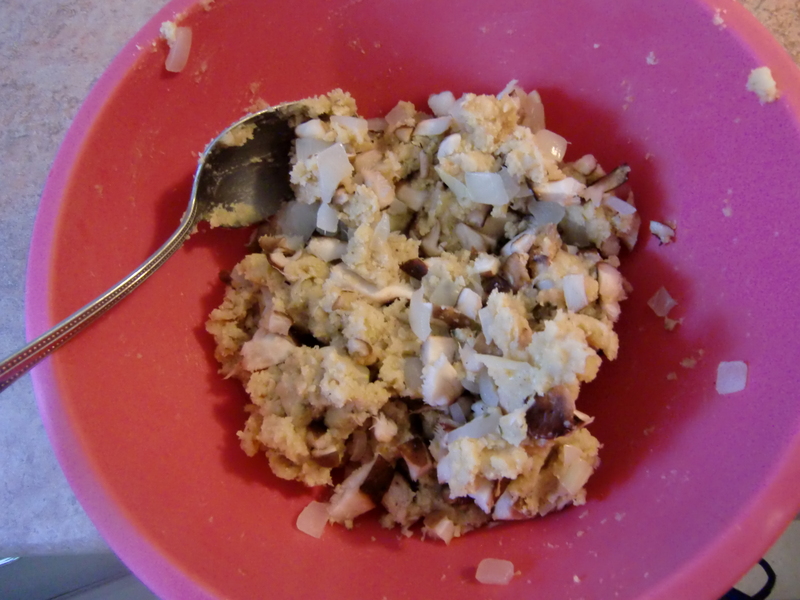 I added about 1 1/2 cup of the dry stuffing and 3/4 cup water. After mixing it up, I put in about three ounces of chopped Shiitake mushrooms. 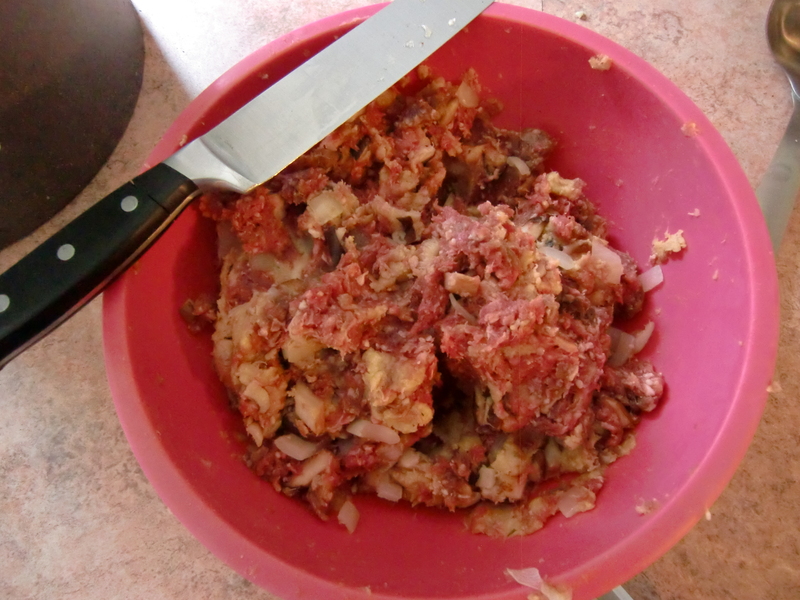 After making the stuffing, I mixed in the pound of ground venison. It’s messy work. Use your bare hands. I am using three huge boneless chicken breasts, each pounded flat with a robust soup ladle while resting between some plastic wrap. Pound that chicken like it owes you money. Time to beat your meat! What? What do you think I was talking about? 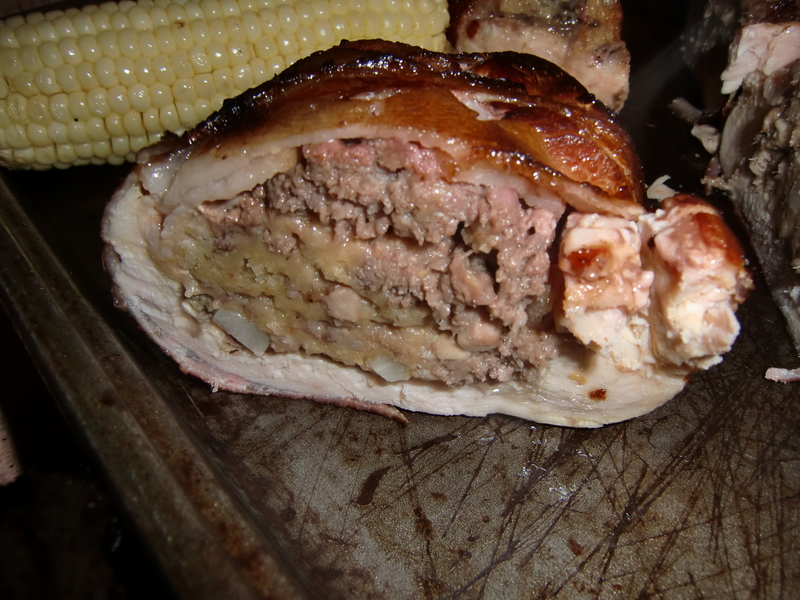 Each flattened chicken breast sat on a few strips of bacon, followed by about 1/3 of the venison stuffing. 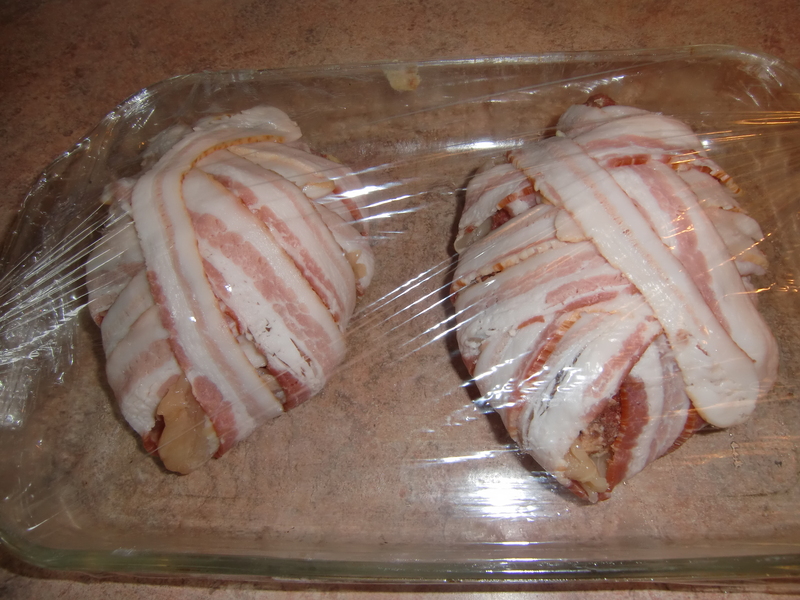 One meat wrapped in another wrapped in another. Wrap it up snugly. 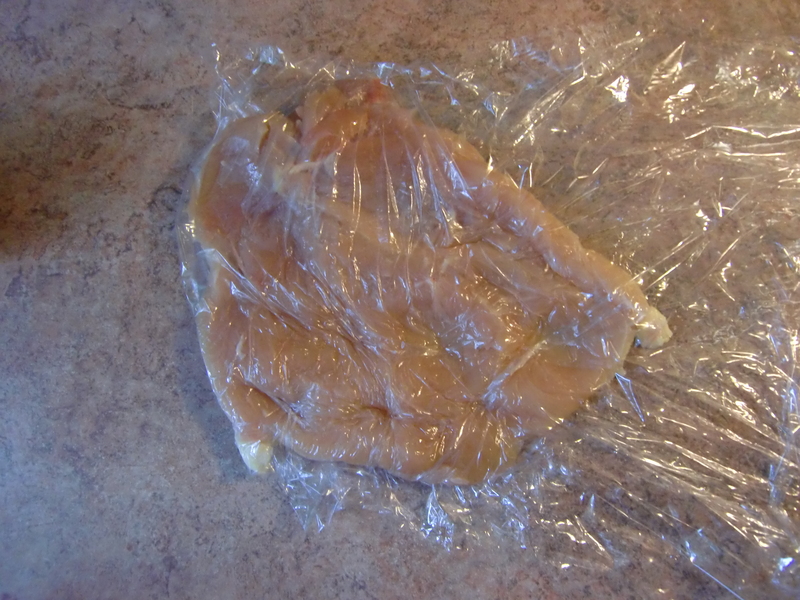 I am prepping in advance of BBQing, so I covered them in plastic wrap for some time in the fridge. Ironic that they about the size and shape of your heart, considering how super awesome all that bacon is for your heart. These things are huge, so they will take some time to grill. Low and slow. With the pork and poultry, make sure your meat thermometer is handy. Get ’em on the grill for some long, indirect heat. 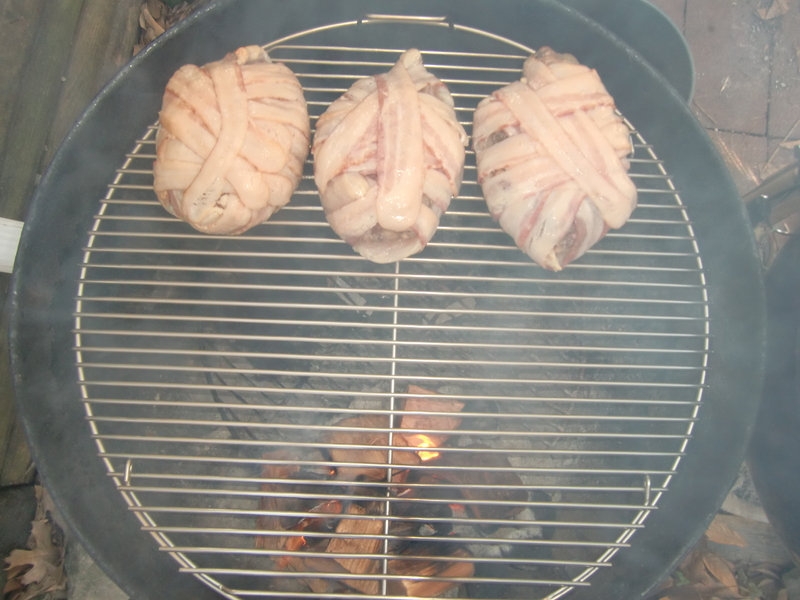 I am adding hickory smoke. As you can see, these things are massive. 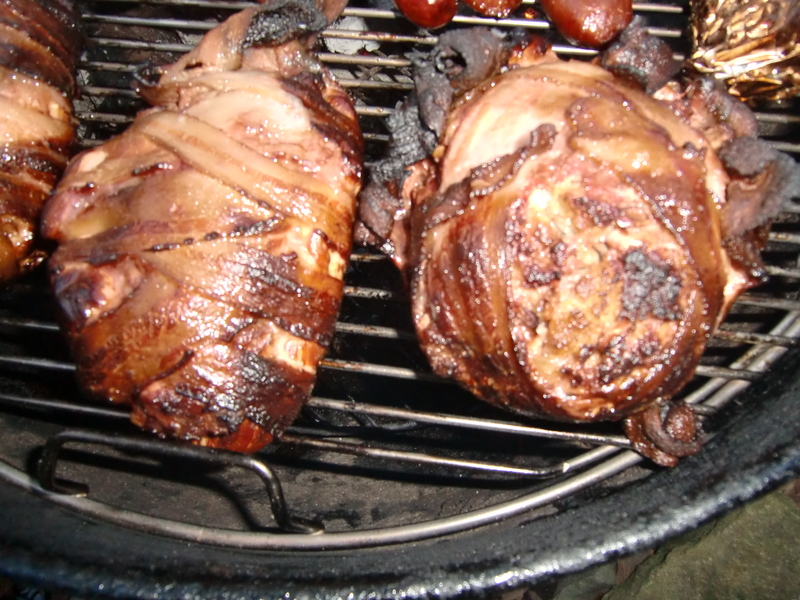 About 30-40 minutes into the grilling, each was rotated 180 degrees, keeping them on indirect heat. More wood chunks were added. A total of 90 minutes was required to get the thickest part of the entree up to 160 degrees. This will obviously vary, depending on the size and conditions of your grill. As huge as these are, I would say that half of one is a serving. I had some salad, asparagus, and two spare ribs on my plate with a half of a stuffed breast and was nearly uncomfortably full. I could really taste the Shiitake mushroom, though a few guests did not pick up on them. The bacon does not add much flavor to the dish – it really does a great job, though, of holding everything together and keeping moisture locked in. You will get a lot of flavorful chicken with hearty bites of stuffing and venison. This turned out really well, and there’s plenty of leftovers for lunch. I paired it with a Schlafly Dry-Hopped APA from a mix pack.